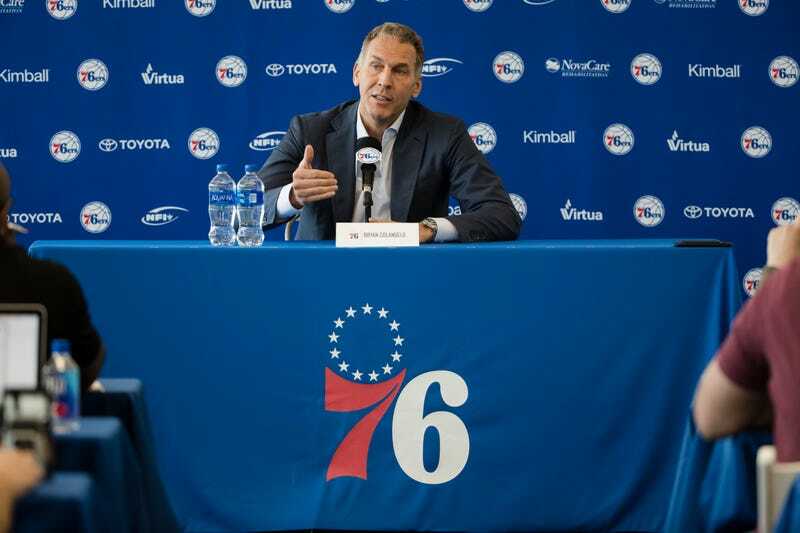 Philadelphia 76ers President of Basketball Operations Bryan Colangelo speaks with members of the media during a news conference at the NBA basketball team’s practice facility in Camden, N.J., on May 11, 2018. In what might be the most bizarre case to ever shame a NBA organization, Bryan Colangelo resigned Thursday as president of basketball operations for the Philadelphia 76ers after a private investigation firm found that Colangelo’s wife created several Twitter accounts to leak damaging and private information about 76ers players. And, get this, Colangelo is pissed that his wife reportedly did this. According to TMZ Sports, Colangelo released a statement throwing his wife, Barbara Bottini, straight under all the buses. The accounts claimed Jahlil Okafor failed a physical, nullifying a potential trade to the New Orleans Pelicans in February 2017. They also called Nerlens Noel a “selfish punk” after Colangelo was criticized for the paltry haul he received from the Dallas Mavericks in exchange for the disgruntled center, and they suggested Joel Embiid hid injury information from the team. Embiid’s fondness for social media was also scorned, and the accounts described the franchise center as “a bit lazy” and “selfish” while saying the 76ers were now Ben Simmons’ team. The accounts even accused head coach Brett Brown of sabotaging the team by benching Markelle Fultz and blamed a family friend and trainer for the guard’s shooting issues.